An intermediate Kruspe wrap horn, this horn offers a great value for an intermediate horn. 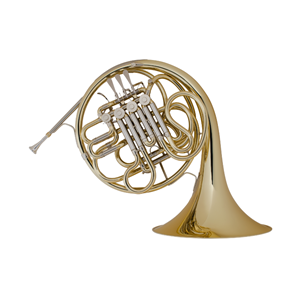 The Conn 6D is an excellent choice for students who are ready to move up to their first double horn. The small throat bell and unique wrap make this a very responsive horn that is well suited for players at a variety of ages and skill levels. Specifications: Key of F/Bb, .468" bore, 12" small throat yellow brass bell, yellow brass mouthpipe, branches and slide crooks, nickel silver outside tubes, tapered rotors and bearings, all string linkages, clear lacquer finish, Conn 2 mouthpiece, case included.